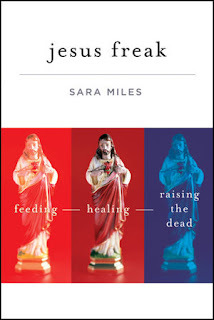 WOUNDED BIRD: SARA MILES - "JESUS FREAK"
SARA MILES - "JESUS FREAK"
I still can't explain my first communion. It made no sense. I was in tears and physically unbalanced. I felt as if I had just stepped off a curb or been knocked over, painlessly, from behind. The disconnect between what I thought was happening - eating a piece of bread, what I heard someone else say was happening - the piece of bread was the "body" of "Christ," a patently untrue or at best metaphorical statement; and what I knew was happening - God, named "Christ" or "Jesus" was real, and in my mouth - utterly short-circuited my ability to do anything but cry. Yet that impossible word, "Jesus," lodged in me like a crumb. I said it over and over to myself, as if repetition would help me understand. I had no idea what it meant; I didn't know what to do with it. But it was realer than any thought of mine, or even any subjective emotion: It was as real as the actual taste of the bread and the wine. And the word was indisputably in my body now, as if I'd swallowed a radioactive pellet that would outlive my own flesh. Sara's conversion upon receiving communion and her continuing desire to live her life as a follower of Jesus made perfect sense to me, because the Eucharist is life-giving and life-sustaining for me. Not only that, her story pretty much convinced me that we'd take the better part by having no restrictions on who can receive communion. After all, it is Our Lord's body and blood, not ours, and what right have we to withhold Jesus' body and blood from anyone? Sara now runs the Friday Food Pantry at St. Gregory's, which feeds hundreds of people each week. Her new book, Jesus Freak, continues her story. The subtitle of the book is "Feeding, Healing, and Raising the Dead". What does it mean to be a Jesus freak? Or, more to the point, what would it mean to live as if you - and everyone around you - were Jesus, and filled with his power? To just take his teachings literally, go out the front door of your home, and act on them? It's actually pretty straightforward, Jesus says. Heal the sick. Cast out demons. Cleanse the lepers. You give them something to eat. You have the authority to forgive sins. Raise the dead. And then Sara tells her story of trying to follow Jesus - her story of taking Jesus' words in the Gospel seriously. She tells of feeding, healing, forgiving, and raising the dead. And her stories are surprising. Jesus sends unlikely souls to join Sara and the members of the community at St. Gregory to do the work. The people who need help are sometimes demanding, dirty, smelly, not nice, drunk, high. They come at inconvenient times, wanting the impossible, but somehow needs are met, although quite often in an untidy way. Sometimes when I'm in church, I think, "What are we doing? Is having church this way, in this place, in this time what we are to be about as followers of Jesus?" Most Christians know so much more about the faith than I do. They grew up in Sunday School; they know their church history and creeds by heart; some have even been to seminary and can read the Gospel in Greek. But when I tell them I met the risen Jesus in actual food, they often pull back a bit, as if I'd declared I saw the Virgin Mary on a tortilla. (Which, by the way, would make me very happy.) And when I tell them that Jesus said we can go ahead and heal the sick, that we don't have to wait for authorization from our bishops to raise the dead, they look worried. I do mean it. I still can't fully explain who the Boyfriend [Jesus] is, but I see him at work everywhere, still breathing in all kinds of people: poor men, crazy women, middle-class retired couples, little kids. They're feeding, healing, forgiving, raising the dead. Maybe the way we do church is all right. I think of Sara's conversion upon taking communion. Maybe gathering together in community to celebrate the Eucharist is what feeds us for the journey after we leave church, where the greater part of the work of seeing Jesus and following Jesus takes place. The formulas of religion may be so over familiar that many believers have a hard time acting as if this most surprising narrative is true. They may doubt themselves and not understand why Jesus trusts us to do his work. They may be sick to death of the institution, tired of propping up a dysfunctional church, and trying to coast by without caring too much. They may, like me, be anxious because there's no way to be Jesus on your own private terms: you have to jump in and do it alongside your Boyfriend's other lovers. If my writing here seems a bit muddled, then it's because I'm feeling my way and not very sure of myself. Both of Sara's books gave me much to think about and much to pray about, and I'm still processing her ideas and words. What I hope I have done for at least a few of you is piqued your interest enough that you will want to read the books. I posted last year on Take This Bread. I loved Jesus Freak and I understand that Sara in person is just as insistent and overflowing with generosity as her books are. It is amazing that Jesus trusts us with the work we are given to do and voices like Sara's are so important because they remind us how utterly crazy and beautiful it all is. Sara is astonishing. I'd love to meet her in real life. I'm part way through Take This Bread. She is an amazing advocate for inclusion and the need for community both in church and in the world. I loved her story in Jesus Freak. Since I know many of the people she writes about, it adds a bit of interest. Amelia, if you know some of the people, I'm sure the book is all the more fascinating.